A just-released CDC report  concluded that disease caused by tick, mosquito and flea bites more than tripled in the US between 2004 and 2016, and that 9 new diseases were either discovered or detected here for the first time during that same period. Infected female mosquitoes transmit pathogens, including West Nile virus, to humans while blood-feeding. Since the first known outbreak of West Nile virus in New York in 1999, the virus has spread through the contiguous United States, Puerto Rico, Canada, Mexico, and parts of South America. Between 1999 and 2013, more than 39,000 human cases were reported in the United States . It is widely accepted that temperatures and rainfall affect the abundance of mosquitoes, spread of pathogens, and incidence of disease. One of only five such regional centers in the United States, Cornell University  leads this NEVBD team  of medical entomologists, virologists, epidemiologists, ecologists, climate scientists, modelers, and molecular biologists. A primary goal is to address surveillance, prevention and response to vector-borne disease by harnessing expertise from academic to local and state organizations. Eight universities, including the University at Albany’s Department of Atmospheric and Environmental Sciences  (DAES); three state departments of health, including the New York State Department of Health ; various educational and outreach programs; and experiment stations, including the Wadsworth Center, come together to this end. Addressing critical needs in education and applied research in vector-borne diseases are among the other goals of this five-year endeavor. Diverse expertise ensures multiple educational opportunities to train the next generation of medical entomologists and public health practitioners to address current and future vector-borne challenges. An innovative, applied research agenda enables us to directly evaluate new strategies for vector-borne disease monitoring, prediction and control. To better understand what environmental factors increase or decrease human health risk from vector-borne pathogens in the Northeast United States, Wadsworth Center and the Department of Atmospheric and Environmental Sciences formed a Climate Change and Emerging Infectious Diseases (CCEID) collaboration to analyze the spatial and temporal variations of West Nile virus infections. 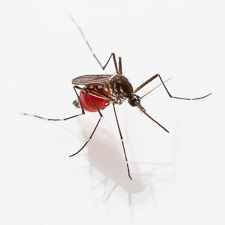 Using mosquito trap data from the Bureau of Communicable Disease Control, New York State Department of Health, and the Connecticut Agricultural Field Station, the CCEID harnesses high-resolution climate data sets and trap records dating back to 2000. Now, as part of the Northeast Center of Excellence in Vector-borne Diseases  project, we (CCEID) aim to develop process-based numerical models that we can use as new predictive tools. Initially, we are using data analytics to carefully test how well these models can reproduce the past changes in West Nile virus prevalence in mosquitoes and associated human cases. If these models can achieve accurate prediction levels, this would reveal new opportunities to use seasonal climate forecasts and climate change scenarios to project the level of risk associated with West Nile virus and other medically important episodic vector-borne diseases such as Eastern equine encephalitis.